It’s awesome when you feel like what you do actually matters. I write these blogs with the intention of helping people find that “Aha Moment” when they’ll finally decide to drop the heavy baggage they’ve been carrying and enjoy this wondrous life that we’ve been given. Sometimes the simplest idea can be the spark to ignite a whole new way of living! 13. Living “It” Out Daily: A Blog Dedicated to Living Out your Best Self! I hope you enjoy these sites – and most of all – remember to pass on the inspiration! 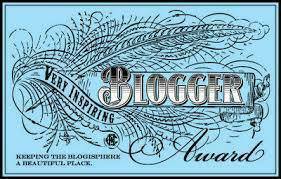 The acceptance of this award comes with the responsibility of nominating 15 other bloggers you considered worthy of this award. (What’s more inspirational than sharing the love?) Additionally you must thank the person who nominated you for the award (in this case – me) and include a link back to their blog – along with posting the a picture of the award. Congratulations – and keep up the great work!